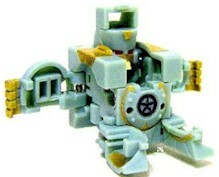 Zoack (ゾアック, zoakku) is a Bakugan Trap that is in the shape of a cube in sphere mode. Zoack is a massive stone monster. It can sustain from the mightiest blows with a little damage. It crushes it’s opponent’s with it’s mighty bear hug. It looks similar to Piercian and Fortress in sphere mode. It was released early at Toys R' Us as a "Season 2 Sneak Peek" by SpinMaster and was the first Bakugan Trap released in North America. Zoack was the only Trap released in all six attributes until Pythantus, and early releases in Special Attack packaging in Pyrus, Aquos, Ventus, and Darkus, and later releases featured it in the Bakugan Trap package in Subterra, and Haos. Purchase your Bakugan Zoack from Amazon now!